We’d love your help. Let us know what’s wrong with this preview of Jonathan James and the Whatif Monster by Michelle Nelson-Schmidt. To ask other readers questions about Jonathan James and the Whatif Monster, please sign up. Such a cute story for kids about the "what if" questions that Jonathan James asks himself when worried about trying different activities. Then, the positive outcomes possible if he challenges that negative self-talk and tries something difficult! Could be useful for discussing anxiety with children. EVERY small child should have this read to them! And again when they start middle and high school... And pack it up with them when they go off to college. Can't wait for more Monsters! Summary: Jonathan James finds himself in new situations and hears his What if monster asking all kinds of questions to stop him from trying something new. What if it’s scary, what if they laugh, what if I fall, What if its yucky? Finally, Jonathan James gets the courage and asks the equations of his own such as What if its fun? What if I like it? Characteristics that support the genre: This story is written in repetitive fashion. Each page starts with the What if question accompanied by a picture Summary: Jonathan James finds himself in new situations and hears his What if monster asking all kinds of questions to stop him from trying something new. What if it’s scary, what if they laugh, what if I fall, What if its yucky? Finally, Jonathan James gets the courage and asks the equations of his own such as What if its fun? What if I like it? Characteristics that support the genre: This story is written in repetitive fashion. Each page starts with the What if question accompanied by a picture to illustrate that question. Writing traits: The story has a great voice trait. When reading this story, you get a sense that someone is speaking and asking the What if questions throughout the entire story. I feel that this story has a great impact as it shows a moral to the story about you can do anything. You shouldn’t be scared, and you should try new things. Don’t let the What if monsters hold you back from enjoying yourself. This story does a great job showing a variety of emotions when Jonathan James is unsure of certain situations. You can see it in the words and the pictures. My 4 year old's favourite book at the moment... Jonathan James has a "whatif" monster who whispers worries and doubt. "What if you tumble? What if you lose? What if she laughs?" etc. But Jonathan James has some questions for the whatif monster, "What if I climb to the top of that tree, and I never slip or skin up a knee ? What if I run in a really big race, and have a great time no matter what place? What if the chance I take in the end is just how I find my very best friend?" An adorable poem wit My 4 year old's favourite book at the moment... Jonathan James has a "whatif" monster who whispers worries and doubt. "What if you tumble? What if you lose? What if she laughs?" etc. An adorable poem with simple illustrations. A great resource to encourage kids, especially those with anxiety. I love the message of this book!! We all have those "what if" monsters in our head telling us all the terrible things that COULD go wrong. But what if it all goes right? What is we are successful? What if everyone likes us? What if we are good at it? What if.... The only regrets we should have in life are the chances we didn't take. This adorable little green guy reminds us that it's ok to try and that so many things can go right! Perfect for anxious kiddos who are prone to worry!! 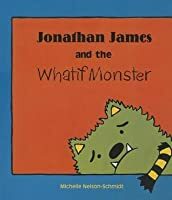 The whatif monster points out all the things that could go wrong for Jonathan James in various situations, but then he flips the script and comes back at the Whatif monster by pointing out all the things that could go RIGHT in each situation. There's a plush toy you can get as well that I encourage my daughter to talk to when she's worried. She loves him! Have you ever been scared to try something? Even if you wanted it a lot!? What stops you from giving it a go? Most of us are afraid of the "What if." 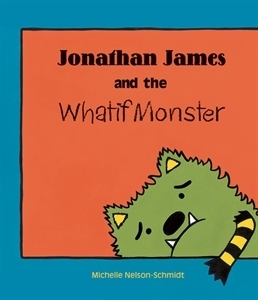 Jonathan James and the Whatif Monster addresses this issue in an easy to understand book for children and adults alike. Teach children to overcome the "what if monster" and go for their dreams! I’m buying a copy of this book for every damn kid I know. As a counselor and play therapist, this is going in my bibliotherapy rotation. Sweet & practical book for talking with kids about fears or anxious thoughts. I love this book so much! One of my favorite children's books that helps to overcome fears and anxieties. Every child should read this book at some point in their life. We have the plush that goes along with this, and it is super cute. This book itself is amazing. Besides the fact that the pictures are great for little ones, the story and message are great, too! It helps kids to understand that everyone has worries, but that we can deal with them without letting them overwhelm us. It's fantastic. Bob says: 5 Platypires and Pugglepire approved! Nelson-Schmidt, Michelle Jonathan James and the Whatif Monster. PICTURE BOOK. Kane Miller, 2013. $12.99. 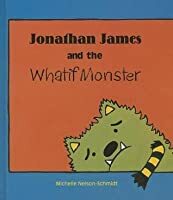 Content: G.
This is a cute story about a little boy named Jonathan James who unfortunately has a pessimistic “Whatif Monster” constantly around him. The Whatif Monster is worried about Jonathan falling out of a tree, failing at his attempt to dive off the diving board, painting an ugly picture, etc. “Now wait just a minute! I hear all your worries; I hear all your claims. But what if you’re w Nelson-Schmidt, Michelle Jonathan James and the Whatif Monster. PICTURE BOOK. Kane Miller, 2013. $12.99. Content: G.
This is a cute story about a little boy named Jonathan James who unfortunately has a pessimistic “Whatif Monster” constantly around him. The Whatif Monster is worried about Jonathan falling out of a tree, failing at his attempt to dive off the diving board, painting an ugly picture, etc. “Now wait just a minute! I hear all your worries; I hear all your claims. But what if you’re wrong?” asks Jonathan James. Jonathan them shows the Whatif Monster that a lot of good things could happen if we just give things a try. The story is written in rhyme and the author does a really good job keeping rhythm and time on each page. The illustrations were cute, but not my favorite- except for the Whatif Monster- he is fun and lovable. This book has a “feel good” message that applies to anyone struggling with attempting anything new. LOVE this book! An inspirational message to build confidence in every child, whether they are filled with doubt or not. As a former elementary teacher, I can say that if you show children they can conquer the world, they will, and with great gusto. Every parent should own this book and read it regularly with their child. Great confidence starts at home. Tuck them into bed and read it together. Happy Reading! If you have a preschooler or a young school-aged kid who struggles with anxiety (like I do), this would be a great book for him or her. It helps them see their worries as separate from themselves. I had the honor to meet Michelle at at school visit. the children were just in awe. I bought 5 copies to put in the school library. they have never stayed on the shelf! Our school counselor also did a lesson with all of the classes about not giving up and to give their worries up to the whatif monster. Michelle's presentation to our school is still talked about even after almost 6 months later! I highly recommend any of her books! This is a wonderful children's book, and it was perfect for Sunday School last week. We were making plans for the program the children will do for the adults in two weeks ... so we read this book, and talked about "what if people laugh" or "what if I make a mistake?" and the book helped us to see that we didn't need to worry about any of that. Great book to encourage children to not worry about the what ifs, but embrace the what if I succeed idea. This is such a great book. Its a rhyming story. The what if monster tells Jonathan James that this negative thing or that negative thing will happen if he does this or that. JJ finally says back 'wait a minute' and starts talking about the positive things that can happen instead. Its a great positive story! I was pleasantly surprised to see what this book was about. It teaches children about worry and how to not to be scared to try new things. Trying is better than not trying at all, you may miss out on something good if you let all that worry get to you. Love this book and actually would love to have a copy for my counseling office-- it teaches children that the "What ifs" of life don't always have to be bad. I have a few high school students who could benefit from that lesson! This would be a good book to read to kids that are in their first year of school and still having some anxiety. Has the interactive stuffed monster that comes with the book would help comfort the kids. Definitely a good book to have in the classroom. I was introduced to this title by the author during a Book Expo (BEA) event last year. We'll be reading it during our August 2015 storytime and have a craft activity for kids to create their very own monster following the reading. I can't say enough positive things about this book. We bought it to help my 4 year old, who has anxiety issues. It's a great tool for opening dialogue with your children about fears, anxieties, and trying new things, and I think the author handles it beautifully. I write and illustrate books for children. I love to laugh, I love to have fun. I do not have time for mean people. Life is too short to not do what you love for a living. Or deal with mean people. I like smiling. It's my favorite. “Promise me you'll always remember: You're braver than you believe, and stronger than you seem, and smarter than you think.